1955 Studebaker Conastoga wagon Photo Picture Classic Cars for sale & Classifieds - Buy Sell Classic Car & Classic Truck Classifieds. 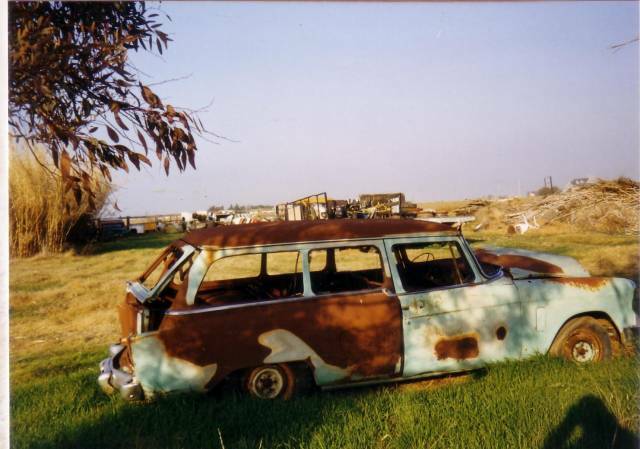 This 1955 Studebaker Conastoga wagon was destroyed in a grass fire back in the early 90's. Good Luck Studebakers1. Man, I whish I could have a classic car to restore. I'm a Studebaker man from way back although I have owned many others. Back in my day, you could buy or trade a car easier than you could afford to go buy gas to fill one up. I see these cars listed that are completely junk for hundreds and even thousands of dollars, and remember when I bough good looking and running cars and pickups for as little as $45.00. I have my Bill of Sale for a really nice 1946 Chevrolet 4 door sedan wuth a light blue lower body and dark blue upper with only 57,360 miles on it on February 25, 1957 just after I came home from the Army for $75.00 Cash and a three month full Guarentee. Man those were the days. I'm in the process of rebuilding a 1951 Stude 3/4 t. Pickup now and the Paint alone cost me more than the whole Truck and I gave over $500.00 for it. Looks like my first field car. is that just rust...or was it burnt out?? Too bad. Wagons are huge these days. I don't recall seeing one of these.